The provincial government of Newfoundland & Labrador is looking to upgrade its system of recognizing the international qualifications of current immigrants. The funding of $50,000 is being made possible for projects that improve the process of credential verification, from contributing pre-arrival services to Newfoundland immigrants have obtained jobs. The process of expression of interest is allowable until Apr 11, 2019. 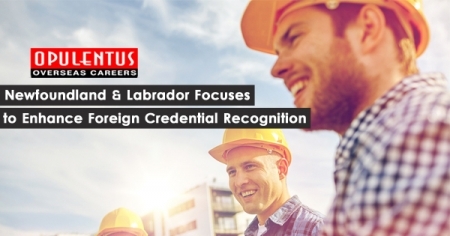 Credential recognition is observed as one of the primary barriers to integration for current permanent residents, who usually find themselves working in less skilled jobs when they initially arrive in Canada. Newfoundland is attending for ways to boost numbers of new permanent residence. Its Education Department, Skills and Labour are demanding for expressions of interest from companies that can give services of credential recognition. Software and Website development or improvement. Production of training and bridging programs. Other projects that improve current international qualification recognition resources. Newfoundland is watching to do this by improving its provincial nominee program, as well as being a member of the employer influenced Atlantic Immigration Pilot. However, bringing a higher number of immigrants is only a bit of the challenge, with integrating and retaining immigrants proving hard in smaller provinces of Canada. By increasing international credential recognition, Newfoundland will make it simpler for new immigrants to find jobs immediately associated with their qualifications, an essential factor when it attains to integration and retention.